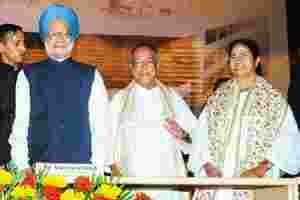 Coalition dynamics: A file photo of Manmohan Singh (left), Pranab Mukherjee (centre) and Mamata Banerjee. New Delhi: There is uncertainty over the proposal to increase foreign investment in domestic retail after the government failed to officially clarify on the claim made by coalition ally and Trinamool Congress chief Mamata Banerjee that it was on hold. While one cabinet minister, who did not want to be identified, said the government may have to put the decision on hold for the time being, another maintained that a final decision would await feedback from the Congress party leadership. The cabinet on 24 November decided to permit 100% foreign direct investment (FDI) in single-brand outlets and 51% in multi-brand stores. The opposition as well as allies of the Congress have been vehemently opposing the decision, saying it would hamstring small shopkeepers in the domestic retail sector. They demanded a reversal of decision. Opposition parties wanted to move an adjournment motion and a debate followed by voting to censure the government over the decision, putting the UPA in a fix, as it has only a razor-thin majority in the Lok Sabha and is a minority in the Rajya Sabha. Both houses of Parliament have not been able to take up any legislative business or debate since the winter session commenced on 22 November. It is due to resume after a break on Wednesday. A fresh twist to the confrontation happened after Banerjee, who met finance minister Pranab Mukherjee on Saturday in Kolkata, claimed that she had been assured that the proposal was on hold till a consensus was reached among the UPA allies. Meanwhile, the opposition continued to be strident. Janata Dal (United), a key constituent of Bharatiya Janata Party-led National Democratic Alliance, said the UPA government should either roll back its decision or accept an adjournment motion and debate the issue in Parliament. “There is no confusion in this regard (in opposition ranks). The government should either roll back the (FDI) decision or accept censure motion in the Lok Sabha on the issue," Janata Dal (United) president Sharad Yadav said at a press conference. Industry leaders Deepak Parekh, chairman of Housing Development Finance Corp. Ltd, and Ashok Ganguly, Rajya Sabha parliamentarian and former chief of Hindustan Unilever Ltd, in a statement on Sunday appealed for an end to the political stalemate. “A democracy encourages openness and permits dissent, but perennial disarray and disruption is sacrilegious," the statement said. “Opposing investment in modern retail for the sake of it is only defending vested interests to the detriment of the vast majority. The farmers, consumers and the common people must raise their voice against this false drama of apprehension against investment and modernizing trade in organized retailing," the statement added. Parekh was one among the prominent citizens, along with Wipro Ltd’s chief Azim Premji who had recently written to Prime Minister Manmohan Singh expressing concern about the policy paralysis in government. Last week, Tata Group chief Ratan Tata had tweeted that political differences should not be allowed to come in the way of the country’s progress. According to a person familiar with the development, the top leaders of the Congress and the government are considering various proposals to ease the situation. “There is a suggestion that the cabinet should meet before the house meets on Wednesday and take a decision to defer the decision considering the public opinion against such a move," the person said, adding that the government may not use the words such as “rollback" or "put on hold". This, said the person who spoke on condition of anonymity, is expected to disarm the opposition in the house when the house reconvenes on 7 December. To be sure, proponents of the policy change continued to be optimistic. Crisil Ltd chief economist D.K. Joshi said he still thinks this is only a delay and the reform measure may eventually get passed after going through the consensus-building process. “This is not a make or mar reform measure," Joshi said. “There are more important reforms such as passing the land acquisition Bill and clearing the hurdles for mining." However, Joshi agreed that given the mood of the industry, speedy implementation of FDI in multi-brand retail would have boosted sentiments. Meanwhile, a survey by industry lobby group Associated Chambers of Commerce and Industry of India suggested that majority of consumers and farmers were in favour of the government’s decision to allow FDI in multi-brand retail, while 80% traders surveyed opposed it. The survey was conducted in 10 major cities including Delhi, Mumbai, Kolkata and Chennai and covered over 2,000 farmers, traders and consumers. Asit Ranjan Mishra of Mint and PTI contributed to this story.